The 2018 baseball season kicks off Thursday, which means we’re in the throes today of stadiums trying to one-up each other with this year’s wackiest concessions (see this dill-pickle-corn-dog thing that will be on sale at Rangers games). For their part, the Yankees have introduced bacon on a bat and beer by Long Island’s Blue Point Brewing that’s somehow imprinted with players’ faces. However, the items that are sure to grab the most attention are the new Grand Slam Milkshakes being served at the Pepsi Food Court that look a lot like the viral concoctions that catapulted Black Tap to fame back in 2016. 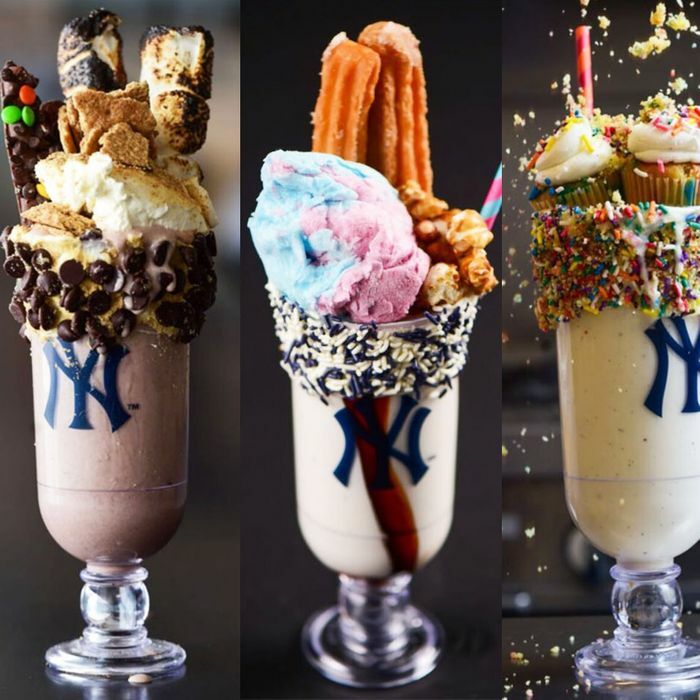 The Yankees’ milkshakes come in four options: Chocolate (chocolate ice cream with a chocolate-chip cookie, fudge brownie, M&M’s, and crushed Oreos), S’mores (chocolate with toasted marshmallows, chocolate-coated pretzels, and graham-cracker dust), the Celebration (vanilla ice cream that’s birthday cake–themed, with frosting and “Funfetti” cupcakes), and something called Pinstripe (an all-in-one MLB dessert concession involving a churro, cotton candy, and Cracker Jacks). Two years is a long Instagram shelf life, but don’t underestimate the staying power of 2,000 gravity-defying calories: The Yankees are merely the most recent in a growing number of places that have rolled out Black Tap knockoffs. There was Dunkin’ Donuts, then TGI Fridays as recently as last November. Black Tap chef-owner Joe Isidori has leveraged the sudden success into three New York City locations, a mini-fleet of food trucks, plus a Disneyland location so far, and the novelty shakes remain so central to Black Tap’s brand that its founders are now facing a $25 million lawsuit from ex-partners who claim that the idea was theirs. We wanted to know what the good people at Black Tap thought about these new shakes, but they haven’t yet gotten back to us. Meanwhile, a Yankees rep does confirm that the Grand Slam shakes are not part of a Black Tap collaboration. Fans will be able to get them, though, at every game, starting with the April 2 home opener against the Rays. Meanwhile, innocent bystanders at the game should hope for the best — these shakes look to be about a foot high, and half of that is whipped cream that melts, cupcakes that can fall off, or something else that will drip everywhere. Power to spectators who manage to keep theirs upright, considering that would be a triumph under even the calmest and most sober of circumstances.